How could I resist this exhibition, when it had been described as ‘engrossing’, ‘striking’, ‘intriguing’ and ‘provocative’ – and absolutely nothing else – by the Guardian, Sunday Times Magazine, Independent and Economist, according to the British Library’s website, outside advertising space and internal noticeboards? Propaganda: Power and Persuasion, open until 17 September 2013, begins with several definitions. These embrace seemingly empirical sources like the 2013 Oxford English Dictionary (‘the systematic definition of information, especially in a biased or misleading way, in order to promote a political cause or point of view’) and the pioneering inter-war theorists of propaganda, Harold Lasswell and Edward Bernays. Aldous Huxley (‘a propagandist is a man that canalizes an already existing stream; in a land where there is no water, he digs in vain’) is placed alongside Nazi propagandist Joseph Goebbels and post-war practitioners and theorists including Richard Crossman, Jacques Ellul and Jacques Driencourt (who suggested, not entirely helpfully, that ‘everything is propaganda’). Prominent modern voices like John Pilger and Noam Chomsky (‘propaganda is to a democracy what the bludgeon is to a totalitarian state’) accompany those of the rather less familiar – except, perhaps, to other historians of propaganda – Philip M. Taylor and the exhibition’s guiding hand, David Welch, who also provides the exhibition’s accompanying book. Welch offers an eminently reasonable summary: ‘the dissemination of ideas intended to convince people to think and act in a particular way and for a particular purpose’. Having slowly negotiated this tunnel of ideas, I emerged in at least two minds. That of the at least mildly pompous historian of propaganda thought things would be considerably more plain and allow franker engagement if Welch stuck to his own definition, providing a specific interpretation against which to judge the exhibition, and skipped the assorted other voices. The other, belonging to the hot, dishevelled man who visited the exhibition through a combination of interest and the irritation of having been temporarily refused permission to renew his reader’s pass for want of an electricity bill from New Zealand, was unsure which of the twelve opening quotations to believe. The latter thought process was, presumably, the point. In a crazy get-rich-quick scheme, the curators of the exhibition opted not to conduct an academic debate with a few dozen specialists. The opening quotations, assuming visitors stopped to read them (which sensible propagandists should not assume), immediately cast doubt on what counts as propaganda and what does not – a perennial problem for those who study it – and this disconcertion continues throughout the exhibition. The next stop is a short US political campaign film from the late 1940s, in which a wide-eyed youth is warned about the possibility of politicians using propaganda, and given pointers on techniques to expect. The attentive lad takes it all in, and is thus both forewarned and forearmed. Phew. Moving on, the first section that is definitely a straightforward series of exhibited items, to be expected at an exhibition, covers the origins of propaganda. 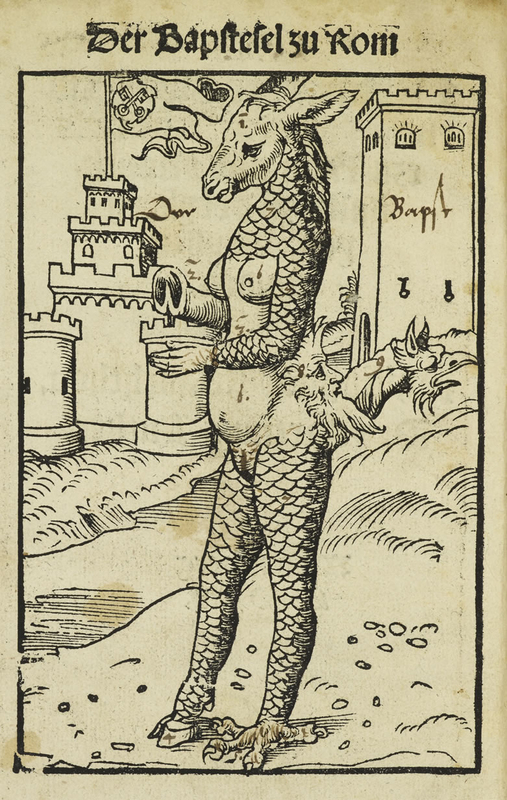 Several centuries are swiftly dealt with via Roman coins, a satirical depiction of the Catholic Church in Martin Luther’s time and the Vatican’s seventeenth-century creation of the Sacra Congregatio de Propaganda Fide (Sacred Congregation for the Propagation of the Faith), from which our modern, undefinable, word emerged. Via an interesting deconstruction of a portrait of Napoleon, the ‘origins’ of modern propaganda are swiftly located with the First World War and the post-war reaction against its excesses. Modern historians may rest assured that this is a decidedly post-1900 exhibition – even the brief moments of Roman and early-modern material are kept firmly in the twentieth century for those who linger by the continually repeated five minutes of avuncular warnings of the US politician. It is unclear whether this last feature is a cunning plan to embed the film’s message in the visitor’s brain, or an acoustic glitch. Crafty. Any hopes visitors may have of steadily working through that initial definitional dozen and identifying the most convincing interpretation are swiftly dashed by liberal scattering of further definitions alongside the objects throughout the exhibition. Likewise, anyone expecting the first section’s simple chronology to continue is rapidly disabused – the remaining five sections are thematic, covering the ideas of nation, enemy, war and health, before the curators suggest we’ve progressed along a seamless chronological track all along by finishing with ‘Today’. By the time I reached this last section – arguably the weakest of the lot – I despaired that the exhibition may have been leaning towards Driencourt all along, notwithstanding its suggestion that social media had made it harder than ever for would-be propagandists to manipulate us because so many voices now immediately answer back. I presume it was coincidental that the computers set up to allow departing visitors to add their views to the exhibition’s blog had malfunctioned, thus silencing me and rendering my two hours of note-taking perilously redundant – or was it? Perhaps it was a sneaky indication of how vulnerable public voices can be to technological failure or restriction. Probably not, probably not. But maybe? Visitors will have their own gripes about what is included and excluded. In my view, the exhibition havers, not entirely successfully, between incorporating the whole world and sticking to the greater familiarity of British, US and European examples. 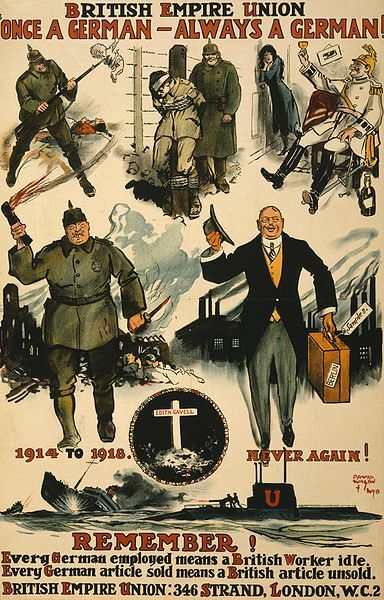 At least these familiar things are presented in less familiar formats like paper bags, handkerchiefs and scarves while others, like the generally inevitable Kitchener poster, do not appear at all (though, alas, the pointing Uncle Sam is not similarly banished). The ‘Enemy’ section provides a relatively eclectic mix of mainly wartime and Cold War examples, commencing with Dwight D. Eisenhower’s assertion that ‘the search for a scapegoat is the easiest of all hunting expeditions’ and ending with George W. Bush’s identification of an ‘axis of evil’. For me, the attention to race which characterises much of the section unduly downplays other selective distinctions while, for some reason, ‘enemy combatants’ feature towards the end of the following section. ‘Health’ – presumably serving as a catch-all for modern public information campaigns, offered an interesting survey but gave the unwarranted impression that, among other things, instructional campaigns relating to motherhood were a post-1920s phenomenon. In the ‘War’ section, there is a fascinating, but isolated, example of failed propaganda – a series of cartoons designed to warn Bosnian children about the dangers of landmines, which, instead, apparently encouraged some to walk deliberately into minefields so they could be rescued by Superman. More on ‘when propaganda fails’ might have offset the general sense of inevitable impact that I felt pervaded the exhibition. As David Welch has amply demonstrated in his own work, there are many factors which can prevent successful propaganda, but this is essentially an exhibition about how and why propaganda succeeds. Finally, I was a little concerned to find, amidst so many definitions of propaganda, so few by women. Though the mannequins on which the definitional dozen men’s words appear are appropriately genderless, I would have liked to see more women’s interpretations of propaganda amidst the complacent, dispassionate, angry and otherwise engaged men’s viewpoints. The index of the accompanying book (which does not claim to catalogue every item and viewpoint on display at the exhibition) lists, at a rough count, 149 men. The other half of the world is represented by Betty Boothroyd, Edith Cavell, Elizabeth II, Marilyn Monroe, Michelle Obama, Leni Riefenstahl and Margaret Thatcher. The exhibition actually includes more than these women, but it could valuably have included more still. 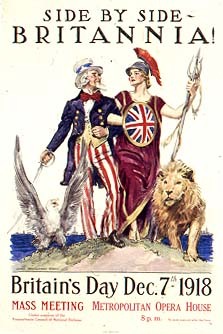 Britannia with the British Lion and Uncle Sam with the American Bald Eagle on a World War I poster. Ultimately, what I found interesting and compelling about the exhibition, despite some reservations, was the decision to avoid defining propaganda. Here, my two minds argue again – from one perspective it is very difficult to judge whether the materials selected are best placed to represent propaganda in the modern world if we are not supplied with a clear explanation of what propaganda is. Leaving the definition open means that anything can be classed propaganda, which rather defeats the object of having a label in the first place. From the other perspective, however, that, again, is the point. In the modern context, when propaganda is essentially a dirty word (unlike, for instance, during the First World War), if we can confidently proclaim that one thing is propaganda and another is not, as the 1940s film clip suggests we should, propaganda is irrelevant. If it is just a persuasive argument, openly expressed, it need not be called propaganda at all. By contrast, when the former Olympics Minister, Tessa Jowell, confidently asserts in a video clip that the London Olympics was not propaganda but a pure and inclusive event that brought Britain together; when the political commentator Iain Dale rejects Conservative MPs’ complaints about Danny Boyle’s ‘propaganda’ on behalf of the NHS at the opening ceremony; or, on a different tack, when even a fondly-remembered road-safety character like Tufty the squirrel isn’t immune from depiction as an instrument of propaganda (the horror! ), it becomes clearer that the incorporation of such diverse definitions of propaganda is not lazy relativism, but a device to provoke further thought. Ultimately, like successful propaganda, this is an exhibition that raises more questions than it answers. I may not agree with the implication I felt the exhibition made that propaganda is all around us, all the time, but I agree that it is worth pondering further what role it plays. David Welch, Propaganda: Power and Persuasion (London, 2013), pp. 207-10.